This is the discography of American R&B/soul vocal group Gladys Knight & the Pips. 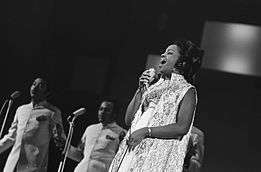 b/w "Room in Your Heart"
1963 "Happiness (Is the Light of Love)"
"If I Should Ever Fall in Love"
B From November 30, 1963 to January 23, 1965, Billboard Magazine did not publish a Hot R&B songs chart. The peak positions for R&B singles listed during this period are from Cash Box Magazine R&B songs chart. 1966 "Just Walk in My Shoes"
1967 "Take Me in Your Arms and Love Me"
1968 "The End of Our Road"
1969 "Didn't You Know (You'd Have to Cry Sometime)"
1970 "You Need Love Like I Do (Don't You)"
1971 "I Don't Want to Do Wrong"
"Make Me the Woman That You Go Home To"
1972 "Help Me Make It Through the Night"
1973 "The Look of Love"
"Daddy Could Swear, I Declare"
"All I Need Is Time"
1974 "Between Her Goodbye and My Hello"
1973 "Where Peaceful Waters Flow"
1974 "Best Thing That Ever Happened to Me"
1975 "Love Finds Its Own Way"
"The Way We Were" / "Try to Remember"
1976 "Make Yours a Happy Home"
"Sorry Doesn't Always Make It Right"
1978 "The One and Only"
"Come Back and Finish What You Started"
"It's a Better Than Good Time"
Listed below are recordings made without Gladys Knight. 1 2 3 4 5 6 "US Albums Charts > Gladys Knight & the Pips". Billboard. Retrieved 2011-09-27. 1 2 3 4 5 David Kent (1993). Australian Charts Book 1970—1992. Australian Chart Book Pty Ltd, Turramurra, N.S.W. ISBN 0-646-11917-6. 1 2 3 4 5 6 7 "CAN Charts > Gladys Knight & the Pips". RPM. Retrieved 2012-01-23. 1 2 3 4 5 "UK Charts > Gladys Knight & the Pips". Official Charts Company. Retrieved 2011-09-27. 1 2 3 4 5 6 7 "US Certifications > Gladys Knight & the Pips". Recording Industry Association of America. Retrieved 2012-01-23. 1 2 3 4 5 "UK Certified Awards Search > Gladys Knight & the Pips". British Phonographic Industry. Retrieved 2012-01-23. 1 2 3 4 5 6 7 "US Pop Charts > Gladys Knight & the Pips". Billboard. Retrieved 2011-09-27. 1 2 3 4 "US R&B Charts > Gladys Knight & the Pips". Billboard. Retrieved 2011-09-27. ↑ "Grammy's Greatest Moments, Volume IV". Amazon.com. Retrieved 2011-11-23.